CEO and co-founder of Integra Service Dogs, Mr Ben Johnson; Chair of Navy’s Keeping Watch RADM Peter Laver; CMDR Ian Davies with Ebony; and Chief Joint Operations AIRMSHL Mel Hupfeld following the presentation of the Federation Star clasp to the Defence Long Service Medal and Integra Service Dogs certification to CMDR Davies. 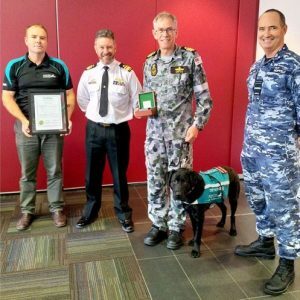 The occasion was marked with the presentation of the Federation Star clasp by Chief Joint Operations, Air Marshall Mel Hupfeld, joined by Commander Maritime Border Command, Rear Admiral Peter Laver. The true guests of honour, however, were three of the most important females in the Maritime Logistics officer’s life and a source constant support; wife Catherine, daughter Michelle, and two year old Labrador assistance dog Ebony. Commander Davies met assistance dog Ebony in May following a period in South Coast Private Hospital undertaking a PTSD Program. “Catherine had seen a decline in my mental health since 1999 following a major incident and has seen a decline after each operational deployment since,” CMDR Davies said. 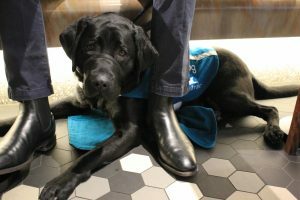 Following the call, Soldier On connected the family with Integra Service Dogs and Ebony was sourced from Guide Dogs Victoria. “Ebony had a medical issue when she was a pup and did not fit the mould as a guide dog but was deemed highly suitable as an assistance dog,” CMDR Davies said. Ebony passed the Public Access Test and is trained to recognise the difference between having her coat on (dressed) and not having her coat on (un-dressed). She becomes more attentive and focused when dressed. “Even when she’s un-dressed she follows me around the house and is always by my side,” CMDR Davies said. Ebony was purchased with the assistance of the RAN’s Keeping Watch, a charity chaired by RADM Laver. 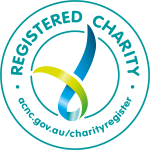 “The charity provides assistance to serving members of the Navy and their families who are suffering financial hardship,” RADM Laver said. CMDR Davies joined the RAN in 1978 with a long career spanning personnel and supply officer postings; training and staff positions and deployments to Baghdad, Bahrain, Sudan and Afghanistan. “I was told very early on in my career that there is no such thing as a bad job, just some jobs are better than others,” he said.